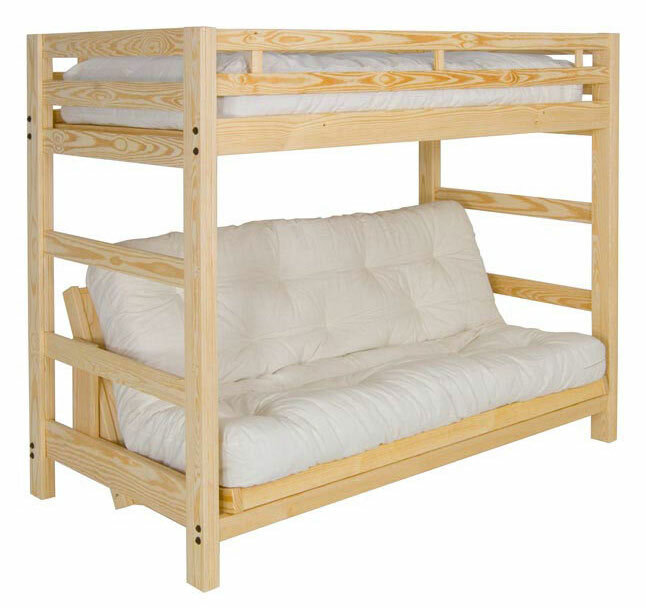 Liberty Futon Bunk - Solid Wood, Super Strong, American Made. $299!!! *Liberty Solid Wood Futon Bunk — A Loft Bed and Futon Sofabed ON SALE NOW! Twin over Full Unfinished $329.00 On Sale Now for $299!! A SUPER-strong, versatile & affordable space saving solution – great for any bedroom, cabin or camp! 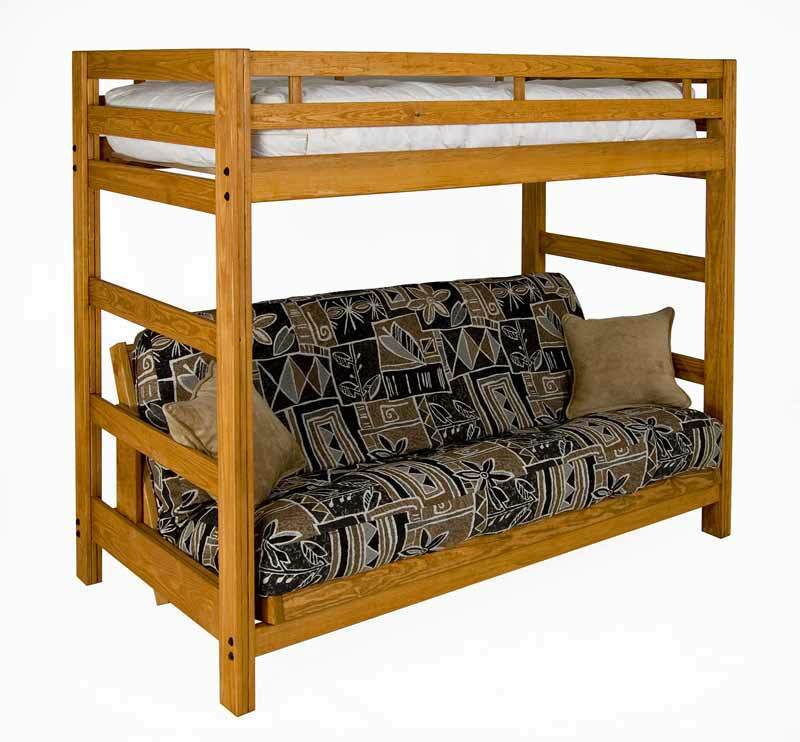 The Liberty Solid Wood Futon Bunk will add tremendous value to any room. It is a phenomenal space saver while providing some much needed seating space. In addition, you will have extra room for guests and sleep overs with the futon sofabed below. Our patented, EZ to convert SuperDeck design allows for effortless conversion from a couch to a bed and back again. In addition, this same design features two recline positions for the ultimate in lounging comfort. 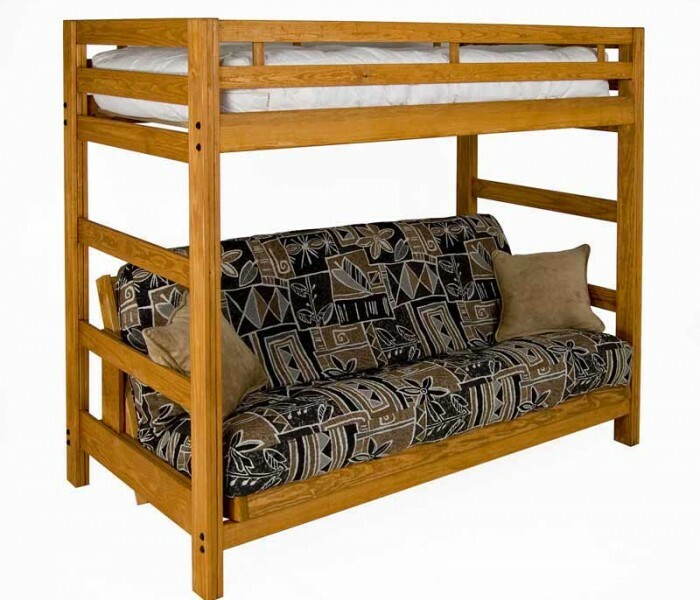 And the strength of the Liberty Futon Bunk is truly incredible, with a maximum capacity of over 1,000 lbs! Built with Premium Southern Yellow Pine, this solid wood futon bunk is all natural – unfinished and chemical free. We also now offer two stain/finish options, either our water-based Golden Oak or a hand-rubbed Linseed Oil. If left unfinished, Southern Yellow Pine will age gracefully, turning golden over time. Or you can stain or paint it, initially or anytime in the future, making it EZ and affordable to personalize any room! TwinXL over Queen: The top bed takes a standard TwinXL size futon or mattress while a Queen Size futon mattress is needed on the bottom. All Liberty Styles come standard with a Full Length Guard Rail. If you prefer a partial/half guard rail, found on our Freedom Lofts/Bunks/Futon Bunks, this can be added. In summary, this solid wood futon bunk is built to last a lifetime while being engineered and optimized for simplicity, comfort and efficiency at a price that can’t be beat. Price is for the frame only. However, we do have a great selection of mattresses and futons to complete your package, just ask!